How can a liquid become a solid? By something removing heat from it and slowing down the particles. By something removing heat from it and speeding up the particles. By something adding heat to it and slowing down the particles. By something adding heat to it and speeding up the particles. 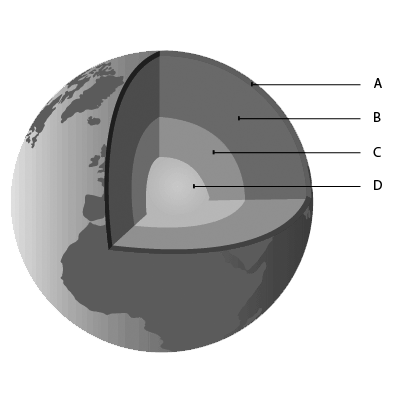 The diagram shows the layers of Earth. Which of the following best describes layer B? The water froze and became . can take the shape of a cup. has a definite volume and shape. can flow into the shape of its container and has a definite volume. has no definite volume and fills the entire space. Condensation is the process of changing a to a .
a solid to a liquid. a liquid to a gas. a solid to a gas. a gas to a solid. A substance that forms a vapor is generally in what physical state at room temperature? If a liquid goes through a phase change and all you know is that the molecules slowed down and moved closer together, what phase did the liquid move to? What are the 3 states of matter? What is the phase of matter called that has molecules arranged in a repeating pattern? Which states of matter have a definite volume? In chemical equations, what does the symbol (s) represent? Can a liquid be a mineral? Why or why not. Vaporization is the change from a to a . Rubber and glass, which become softer as they are heated, are examples of what?